Standing on New Bedford’s Acushnet Avenue, René Moreno runs into a man who grew up in the same village he did in Guatemala. They talk for a couple of minutes, and although you might assume they are speaking in Spanish, they aren’t. They’re speaking K’iche, a Mayan language spoken in the highlands of Guatemala. It is just one of 22 indigenous languages spoken in the Central American country. 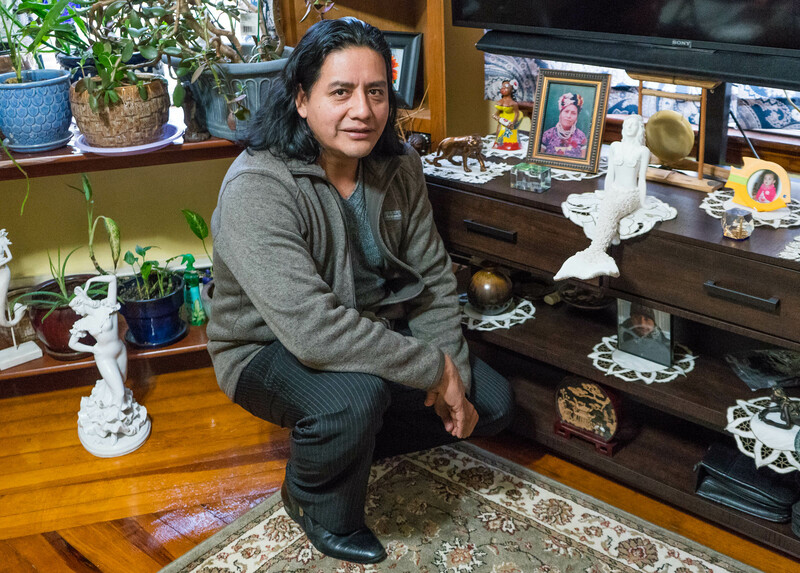 New Bedford is home to a growing Latino population including a large number of people from Guatemala. And many of the city’s Guatemalan immigrants speak K’iche. This can create some challenges, especially during legal cases with K’iche speakers, who do not understand Spanish or English very well. That’s where Moreno comes in. He is a K’iche interpreter. Rene Moreno speaks K'iche, one of 22 indigenous languages of Guatemala. It is hard to know exactly how many K’iche speakers live in New Bedford, but people who work in this community estimate the number is somewhere between 6,000 and 10,000 people. Moreno has lived in New Bedford for more than 20 years. He left Guatemala during the country’s civil war, which began in 1960 and continued until 1996. During that time, the military persecuted indigenous communities, whose members they believed to be allies of a guerilla movement. More than 600 massacres occurred in the K’iche region of Guatemala. Moreno first fled to Antigua, a city in southern Guatemala, but he said that several attempts were made on his life. At 17, he decided to leave the country altogether. His final destination was supposed to be Québec, Canada, but he ran out of money along the way and ended up in Providence. There, Moreno met a Dominican man working at a gas station, who told him where he could find work. Moreno told the man he needed work. Moreno found himself in New Bedford at a fish processing plan where he began working. In the beginning, he made just $1.50 an hour. He decided to stay since there was work and a sizable K’iche community. As he settled in to his new life, Moreno began to worry about his immigration status. With his limited English and Spanish, he wasn’t sure what he needed to apply for legal residency. He, along with a couple co-workers thought about starting the process, but they were afraid. “We went to Boston a couple of times, to the immigration office. And we just stood there, looking at the building. And then we said, ‘No, let’s go back,’” said Moreno with a laugh. During an immigration raid on the fish processing plant where he worked, Moreno was picked up and taken into custody. He was later released, but not before learning that he could apply for political asylum because of the threat to his life in Guatemala. In October of 1999, in a New Bedford courtroom, the judge presiding over his immigration case told him his request for asylum had been approved. “And I didn’t know how to react. I just said, ‘I’m safe,’” said Moreno. Nearly 20 years later, tears still well up in his eyes and spill down his face as he recounts the memory of that day. After four years of living in the U.S., Moreno had learned Spanish and some English. He had also picked up several K’iche dialects distinct from his own, while working in the fish processing plants. Moreno took the judge’s advice, and enlisted his help to get over a few setbacks, including not having any formal education. Eventually, he completed an interpreting program in Boston, and his skills as a K’iche interpreter were in high demand. He began working on immigration cases in Massachusetts, Rhode Island and Connecticut. “And then I started going to Florida, Kansas, I went to North Dakota. I’ve been to Iowa, New Jersey. They start calling me everywhere,” Moreno said. In New Bedford, many people remained unaware of the K’iche community until an immigration raid on a factory in 2007. The raid resulted in the arrests of more than 300 undocumented workers, many of the them K’iche. “It was a traumatic event for many people in the community,” said Lisa Maya Knauer, chair of the Department of Sociology and Anthropology at the University of Massachusetts, Dartmouth. Knauer began studying the Guatemalan community in New Bedford after the raid. At America’s Market, a Latin-American grocery store in New Bedford, René Moreno points out Guatemalan products on the shelves, like “Pepian,” a mixture of herbs, dried chiles and pumpkin seeds used to make a traditional Guatemalan chicken dish. Moreno was recently offered a full-time interpreting job in Texas, but he’s not sure whether he will take it. He feels that his skills are needed in New Bedford, and people here trust him. For Moreno, the job of an interpreter goes beyond translating words in a courtroom or a doctor’s office. As he sees it, he’s helping people navigate a confusing and frightening experience, one that he once went through himself. So for now, at least, New Bedford is still home.